A new series from Quake. And it’s not about anime! 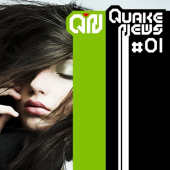 Years ago, Quake News was a series of promo vinyls released to promote Quake Trance Best CDs. The vinyls typically contained 4 full-length tracks, but this new CD series will have 8 tracks per release. It appears that the CDs will be released monthly for the low price of 951 yen each.